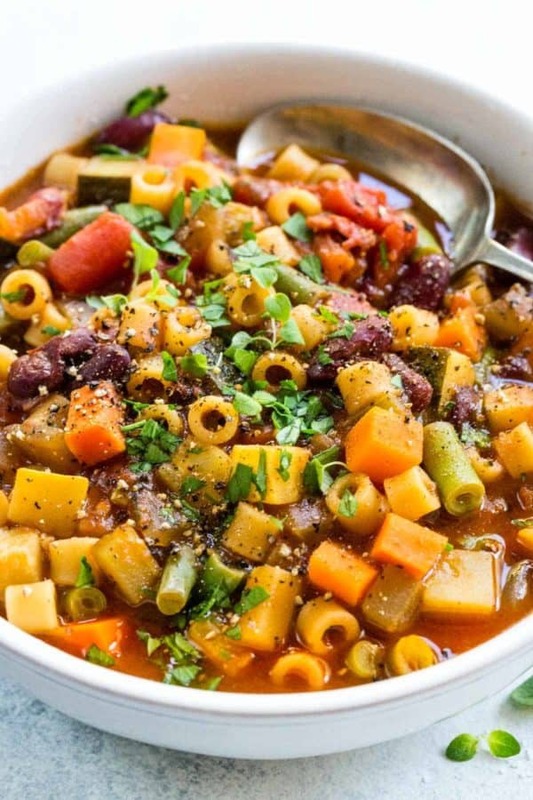 Classic Italian minestrone soup is a colorful mix of vegetables, beans, fresh herbs, and ditalini pasta simmered in a savory tomato broth. Sauteing onions, celery, carrots, and squash delivers a flavor punch even before the soup begins to bubble on the stove. Pairing fresh ingredients with canned beans and tomatoes creates a quick stove top dish. Minestrone soup may seem simple to prepare, but all of the various elements brings on some complexity. Knowing when and how to cook the bite-sized pieces of vegetables, while timing the addition of the green beans and pasta are key. The goal is to nail tender and vibrantly colored food in the bowl, not mushy and dull spoonfuls. After making many steaming pots of soup, I’ve learned that by adding each ingredient in a particular order and duration gives smile-inducing results. To create a dish full of flavor that saves on time, I like to crack open the pantry to find convenient ingredients and break out my handy can opener. I’m sharing my essential techniques so that you can proudly serve the soup to your loved ones with ease like a pro. To make it a one-pot meal, add shredded or diced marinated chicken. If I’ve got a leftover roasted chicken, I use it as a shortcut. Saute the onions, garlic, celery, carrots, and squash to lightly brown and enhance the flavors of the vegetables. Add canned beans at the end of cooking to help retain their shape. Simmer the fresh bean beans just until crisp-tender and bright green in color. Cook the dried pasta at the very end cooking. The starches will slightly thicken the soup. Staggering the incorporation of each ingredient ensures the desired texture and color. Making vegetable soup is an excellent way to incorporate a diverse array of healthy ingredients. Fresh green beans add a nice crunch, along with fiber. A colorful medley of tomatoes, carrots, and celery provide phytonutrients like lycopene and vitamins like beta-carotene. Legumes like red kidney beans are an excellent vegetarian and vegan source of protein as well as fiber. My son loves to help. He grabs the produce from the refrigerator, asking about each one, and beaming with excitement as I make rhythmic quick chops on the cutting board. I can see him salivating as he perches on a stepping stool, helping to stir the huge pot. Getting the kids involved early on in the cooking process is a great hands-on way to learning how to build better eating habits, and it’s fun too! Once you’re ready to eat, grab an oversized spoon. It’s the best way to efficiently collect all of the little tender pieces of food in the bowl. Breaking apart a piece of crunchy baguette to dip into the broth and soak up all of the soup ensures not one drop goes to waste. Do canned tomatoes compare to fresh tomatoes? For soups, chili’s and sauces, I use canned tomatoes for convenience and flavor. When picked and processed at peak harvest, vine-ripened plum tomatoes or San Marzano provide excellent sweetness. Otherwise, it’s hit or miss at grocery stores, as tomatoes can be picked when still green, and then treated with ethylene gas to ripen before it hits the stores. Classic Italian minestrone soup is a colorful mix of vegetables, beans, fresh herbs, and ditalini pasta simmered in a savory tomato broth. Heat a large dutch oven or stockpot over medium-high heat and then add in oil. Once oil is hot add the onions, celery, and carrots, saute until lightly browned, 5 minutes. Add zucchini and yellow squash, saute for 2 minutes. Add tomato paste and saute for 30 seconds. Add diced tomatoes, vegetable stock, 1 teaspoon salt, rosemary, bay leaf, and oregano, stir to combine. Turn the heat to medium and bring the liquid to a vigorous simmer. Add red kidney beans and pasta to the pot, cook until pasta is al dente, about 10 minutes. Add green beans to the pot and cook until tender and bright green, about 3 minutes. Remove rosemary sprigs and add more vegetable broth as needed to thin out the soup, about 1 to 2 cups, warm before serving. Taste soup and season with more salt and pepper as desired. MAKE IT GLUTEN-FREE: Use gluten-free pasta instead of wheat pasta. It’s still hot up in Northern California reaching mid 80’s -90’s in the valley. It’s not yet the fall up here but this soup looks good to make. I like the noodles you added. Looks more fun than the elbow noodles I usually make it with. It’s still hot here too Janice! I found these vegetable spiral noodles at Albertsons! What a wonderful soup! It has been so cold and your soup warmed our bodies and souls. I really have to get that vegetable pasta. I will be on an Albertson hunt! I think it would hold up so much better than my corkscrew pasta. Mine fell apart. I added two fully cooked spicy chicken Italian sausages to satisfy my carnivore husband Jim. He says two thumbs up! My winter break from school is to try more of your recipes! Thank you so much Katie! I’ll pick you up some of that pasta the next time I go to the store 🙂 The sausages sound like a great addition, I’ll have to try that! I would love to hear how the next cooking adventures go, happy 2016! Especially as I cook for one and can freeze in bags!!! I made portions and froze the soup too! This recipe sounds wonderful! We have tried so many of your delicious dishes. Is the unsalted vegetable stock used for a healthier version, or is there a science behind it? Thank you for always sharing your knowledge. Hi Judy- Great question! I always used unsalted stock so that I can control the sodium level of the soup. This is an excellent fresh minestrone soup, the first time I have ever made one.I added one 14 oz. can diced tomatoes before I realized I had two cans of fire roasted diced tomatoes. I added the additional can of fire roasted and it added a lot of flavor. Next time I will go for two 14 oz. cans of the fire roasted tomatoes. I also added Italian seasoning versus the other herbs. I skipped the kidney beans as I felt the 1/2 can of organic green beans was enough. I was a bit disappointed in my pasta. I couldn’t find the recommended pasta. Instead I used a small vegetable twisted elbow. Maybe I should have added another 1/2 cup. What type of pasta did everyone else use? Thank you for your feedback Kay! You’re modifications were helpful to hear.